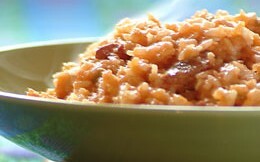 Red rice is a Mexican dish made with garlic, bacon, onions, peppers, and tomato sauce. Red rice tastes even better the next day. Place the rice in a large bowl of water and scrub the rice between your hands. Keep changing the water until it is clear of starch. Pour off the water. Use a deep, heavy pot with a lid. Cook the bacon, or if you prefer smoked turkey, with 1/4 cup of vegetable oil in the bottom of the pot. Add your onions, peppers, garlic and cook until done. Add the tomato sauce and 2 cups of water. When the sauce begins to boil, add the rice. Use a fork to make sure the rice is evenly distributed in the tomato sauce. Never stir the rice once it begins to boil. “Never put a spoon in rice that’s cooking...” When the rice begins to boil, lower the heat. Wrap a wet brown paper bag around the lid of the pot and cover. Slow-cook. “Every grain must stand on its own. Every grain must be red.” Slow-cook until the rice absorbs all of the sauce.